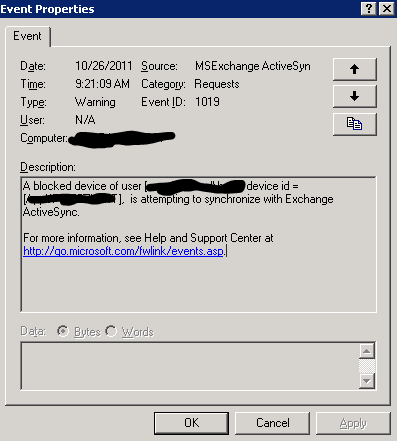 Exchange Activesync Issue: Device is able to authenticate, however it will not sync. We have recently taken our solution for Exchange email on IOS devices into production. We are using client certificate authentication on TMG and we use MobileIron to manage the devices and handle the certificate enrollment on the devices. We had an issue where our root CA’s crl had expired, which as could be expected led to a situation where no one could sync their email. After tackling that problem one user was still not able to sync. That user had been part of the pilot group so we first cleaned up the certficate clutter for that user account, but he was still not able to sync. As I mentioned before, we use client certificate authentication on TMG, but no delegation to our CAS servers. And since the authentication on TMG worked as expected for that user we decided to examine the logs on the CAS server. We still have no clue why this happened – either something went wrong while we were troubleshooting the certificate issues or somehow the device partnership was corrupt ( even though we had deleted that manually before with no result).